Cleanroom shoe covers can be used to keep unwanted contamination out of many cleanroom areas! Perfect for factories, medical facilities, pharmaceutical companies, food preparation and more, our disposable shoe covers can save you money and time by keeping your areas contamination free! 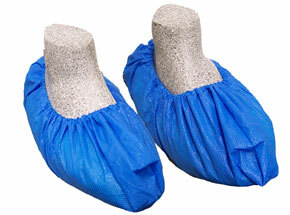 Shoe covers are an ideal solution to reduce the spread of dust in many environments and job sites. Choose from a variety of styles that are waterproof, chemical resistant, or anti static. Boot covers protect both ankle and calf-high boots. Choose from a variety of covers that are made from vinyl, polypropylene, or Tyvek. Looking for shoe covers and not sure what to get? Check out what our best sellers are for a starting point. They are all lint free and great for a variety of applications. Cleanroom shoe covers are made to reduce the spread of dust, dirt, and other particulates from one area to the other. There are 3 different materials that shoe covers are made of, polypropylene, polyethylene, and polylatex. All the materials are lightweight, durable, and provide excellent protection against dust. 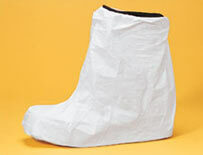 For protection against liquids you will need to look at polyethylene or polylatex shoe covers. All shoe covers are made with an elastic band around the opening to ensure a snug seal around the foot. This keeps dust or dirt on the shoes inside the shoe cover and make it so dust has limited surface area to collect. Shoe covers are made to stretch to accomodate a range of shoe sizes. Cloth shoe covers, those made with poly propylene, are stitched together and have a single seam, while polyethylene and polylatex are seamless. Is static buildup a concern? Disposable shoe covers with conductive strips or anti-static treatment are also available, and have the same great protection against dust and particulates. Click here for different styles available. Cost Effective and Easy to Order! By using just a few shoe covers you can save on many man hours on cleanup and decontmination costs. Cleanroom shoe covers can be found in a wide variety of industries such as food processing, manufacturing, home renovation, server rooms, asbestos and lead cleanup, laboratories, medical facilities and much more. Our disposable shoe covers are available at a low price making it possible to never run out of these useful and effective money savers. Choose from one of our many styles and sizes of shoe covers to get the contamination prevention you need for your needs!